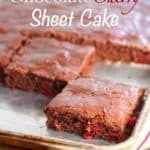 Chocolate and Cherrys baked up on a Sheet Pan! The flavor combo is dynamite and it feeds a crowd! Oh it’s easy to make too…perfect cake! 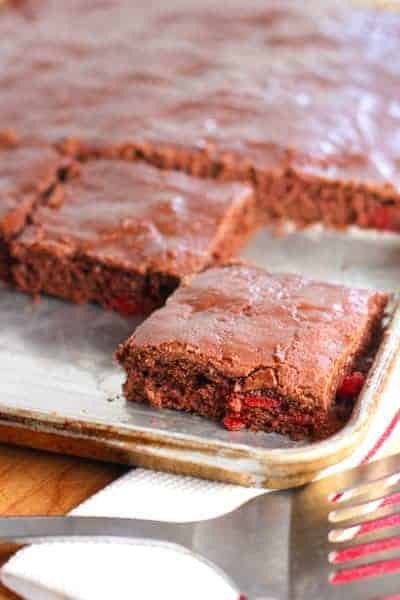 I could go on and on telling you how good this cake is but clearly you can see that….chocolate-cherry-cake…there is nothing here that is not to love! And wait until you hear how easy it is! But before we dive into this recipe, a little background for your reading pleasure. Music please! This recipe is the 27th Pillsbury Bake Off Winner! It is royalty in the baking world. So where did I find this little gem? I’d love to tell you I spent hours looking up all 52 Pillsbury Bake off Winners…but nope. There is an easier way. A wonderful blog called Mom Loves Baking. This gal baked all 52 winning Pillsbury Bake Off recipes in 52 weeks! Kinda like a Julie Julia thing without all the fussy frenchie stuff. Super cool. Loved reading her commentary and experience. This Chocolate Cherry Cake recipe was by far her favorite recipe of all 52. So I’d say thats a pretty good recommendation! Store bought cake mix and a can of cherry pie filling are the main ingredients, the rest is a pretty short list. I have been told, by all those I shared this lucious cake with, (and I shared a lot..it’s a big cake!) that it was some of the best chocolate cake they have had! The original recipe was called Chocolate Cherry “Bars” but I renamed it “Sheet Cake” (see chubby little fingers making quote marks), because I am currently obsessed with cooking everything on “Sheet Pans”. So far I’ve made Sheet Pan Fajitas and Crispy Chicken Sheet Pan Dinner…both are doing pretty well so why quit this sheet now? I’m gonna run with it! Next sheety recipe is undetermined at this time but there will be more sheet…there is always more sheet! This easy and super delicious cake is made with boxed mix and a can of cherry pie filling! Doesn't get easier or yummier! 1 oz pkg. Pillsbury™ Moist Supreme™ Devil's Food Cake Mix 18.25-. 1 oz can cherry pie filling 21-. Heat oven to 350°F. Grease and flour 15x10x1-inch baking pan or 13x9-inch pan. In large bowl, combine all cake bar ingredients; stir until well blended. Pour into greased and floured pan. Bake at 350°F. until toothpick inserted in center comes out clean. For 15x10x1-inch pan, bake 20 to 30 minutes; for 13x9-inch pan, bake 25 to 35 minutes. In small saucepan, combine sugar, milk and margarine. Bring to a boil. Boil 1 minute, stirring constantly. Remove from heat; stir in chocolate chips until smooth. Pour and spread over warm bars. Cool 1 1/4 hours or until completely cooled. Cut into bars. Chocolate and cherries! What’s not to like! And with it being a Pillsbury Bake-Off winner, I know it will be terrific.Thanks for passing this one along.